Zeta and \(L\)-functions play a central role in number theory. They provide important information of arithmetic nature. 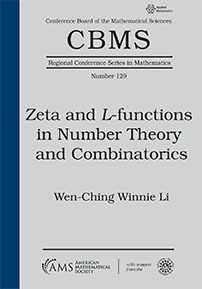 This book, which grew out of the author's teaching over several years, explores the interaction between number theory and combinatorics using zeta and \(L\)-functions as a central theme. It provides a systematic and comprehensive account of these functions in a combinatorial setting and establishes, among other things, the combinatorial counterparts of celebrated results in number theory, such as the prime number theorem and the Chebotarev density theorem. The spectral theory for finite graphs and higher dimensional complexes is studied. Of special interest in theory and applications are the spectrally extremal objects, called Ramanujan graphs and Ramanujan complexes, which can be characterized by their associated zeta functions satisfying the Riemann Hypothesis. Explicit constructions of these extremal combinatorial objects, using number-theoretic and combinatorial means, are presented. Research on zeta and \(L\)-functions for complexes other than graphs emerged only in recent years. This is the first book for graduate students and researchers offering deep insight into this fascinating and fast developing area. Graduate students and researchers interested in Zeta and \(L\)-functions.